Last year for my birthday I decided to give myself the gift of time and take the month of May off from my blog. Well, I’ve decided to carry on that tradition and take May off again! That’s right, another birthday gift to myself involving a few less things on my plate for the month. And, because my birthday is at the beginning of the month, that really does give me the whole month to celebrate! While it is still only April, this post is my preemptive attempt to let everyone know that I will not be publishing any new posts next month. I have a few things scheduled already on social media, but otherwise, the month of May will be time for me to stop and smell the (birthday) roses! Not following me on social media yet?! See all sorts of travel goodies by following me on Facebook and Twitter! I’d love to hear some birthday wishes from you too if you decide to stop by! In today’s fast-paced world, I think self care is really important. Everyone should take some time for themselves to relax, unplug, and kick back, and this is one of my ways of doing just that. Catch you in June with new blog posts Catalina Island, Celebrity Cruise lines, New England, Costa Rica and more! 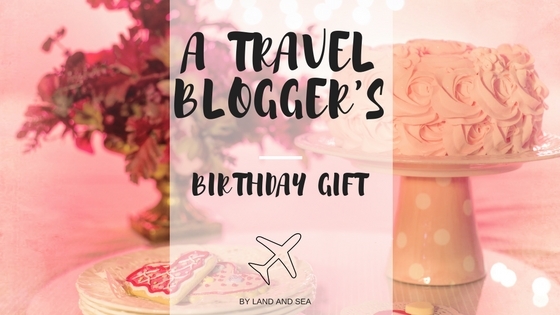 And, if you’re needing gift ideas for the traveler in your life, here are some of my all time favorite travel gifts for you to consider! Happy Birthday to you, indeed! Enjoy it to the max, Jenn! Albiet a little early – Happy Birthday!!! Best wishes for a wonderful birthday, and relaxing month! Hope you are able to enjoy your time off from blogging. I am doing the same because I am traveling for 17 days in May. I want to totally disconnect and focus on my trip. Awesome – enjoy your trip! Happy birthday, Jenn! May should be a lovely month to enjoy more free time. “See” you in June! Yes, it really is. I’ll probably still write in my downtime for the same reason. But, between work, school, and blogging, I just need a break! Of course we will Angie!! Happy birthday!! It looks like you have had some epic adventures and some awesome adventures coming up! Happy birthday! Its my birthday in a few days too – not sure how I will be celebrating it but an afternoon tea may be on the cards! Thank you and happy birthday to you too! Tea sounds delightful! !